Is the Superb Ambition variant more value for than the Passat Comfortline? Skoda launched the Superb Ambition variant priced at Rs. 22.50 lakh for the 2.0 TDI diesel automatic. 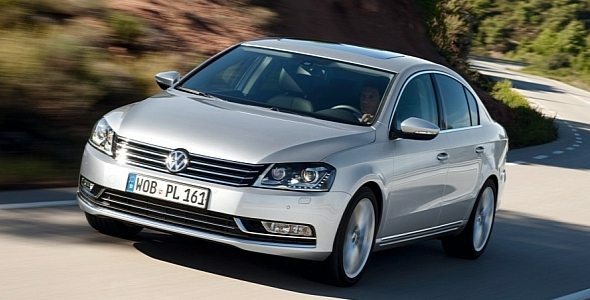 On the other hand Volkswagen launched the new Passat in March 2011 and it costs Rs. 25.28 lakh but is it worth the extra Rs. 2.78 lakh? We find out! Here we compare the Superb Ambition variant and the Passat Comfortline to find which luxury car is better than the other in terms of performance, looks, space, comfort and features. The Passat is powered by a 2-litre diesel motor that puts out 168 Bhp of power and 350 Nm of torque. The Superb too is powered by a 2-litre diesel motor but it churns out only 140 Bhp of power and 320 Nm of torque. Handling wise, the Superb has an edge due to its precise steering feedback and stiff suspension setup. The Passat is easy to steer at parking speeds, but when driven at high speeds, the steering feels a bit vague and doesn’t inspire as much confidence as the Superb. However, when it comes to ride quality, the Passat sorts out all road bumps and gives the passenger a plush ride while the Superb feels a bit jittery in comparison. Overall, the Passat leads the race in performance while the Superb has an edge in terms of handling. Luxury sedans are all about space and comfort. Both the Superb and Passat offer great comfort with the adequately bolstered front seats. However, things are different when you compare the rear seat space of these cars. The Superb has a spacious rear seat that offers more legroom, slightly more headroom and a bit more shoulder room than the Passat. However, that doesn’t mean the Passat is not spacious. It is just that the Superb offers more than adequate rear seat space. That said, except for very tall passengers, both the Superb and Passat offer ample space for rear seat passengers. With regard to comfort, both the cars match with each other. Space wise, the Superb has a slight edge over the Passat but comfort wise, both the cars are equally good. The Passat and Superb boast of sophisticated European design language. 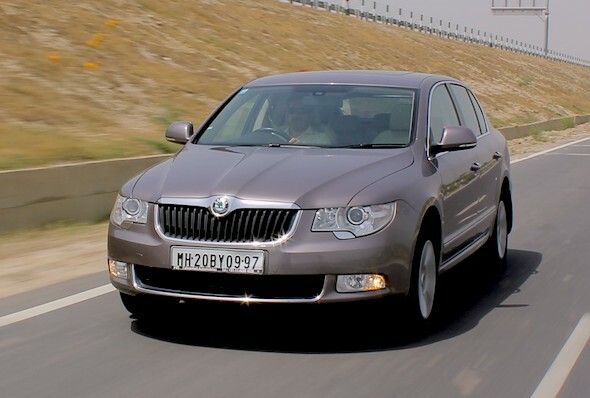 The Superb looks sporty, thanks to the Skoda family’s vertical grille and sharp-looking headlamps. The Passat looks classy, clean and simple. But, there are subtle elements such as the LED lights and bi-xenon headlamps in the Passat that gives it a premium feel. The side profiles of both the cars reveal their long wheelbase and the undeniable business-class look. At the rear, the Superb stands out a bit with its radical taillamp cluster while in the Passat everything falls in its place, but that also makes it look all too familiar. The interiors of the Passat have dark shades, but the quality of plastics, fit and finish is top notch. That doesn’t mean the interiors of the Superb are not premium. It is only when you compare them with the Passat you feel that the Superb falls a bit short. Summing up, the Passat with its extensive use of chrome and conventional styling is our choice. The Superb Ambition variant is equipped with features such as ABS with EBD, Hydraulic Brake Assist, Electronic Differential lock and eight airbags which includes dual front airbags, side airbags at front, side airbags in the rear and curtain airbags at front and rear and Skoda swing audio player with eight speakers. However, the Passat Comfortline is loaded with features not offered in the Superb Ambition such as Bi-xenon headlamps, 6-way electrically adjustable front seats, electric parking brake with auto-hold function and hill hold control, RCD 510 touch screen music system with MP3 player including 6-CD changer, SD card reader, aux-in & 8 speakers, Electronic Stability Programme (ESP) including ABS with brake assist, ASR, EDL & TCS, Attention Assist. Overall, the Passat Comfortline offers more features than the Superb Ambition. The Superb Ambition is priced at Rs. 22.50 lakh which is Rs. 2.78 lakh cheaper than the Passat Comfortline. With regard to ARAI-certified mileage, the Superb Ambition returns 17.16 kmpl while that of the Passat is 14 kmpl. Hence, the Superb has an edge over the Passat when it comes to mileage. The Superb Ambition loses many comfort features offered in the Passat Comfortline, but the good thing is it has not compromised on safety features. Besides, the Superb Ambition is significantly cheaper than the Passat Comfortline, making it a better VFM than the German sedan. If you are willing to shell out an additional Rs. 2.78 lakh for the comfort features and a better performance that the Passat Comfortline offers, it’s a good bet. But, if you are on a tight budget and can manage living with slightly less comfort features, the Superb Ambition is a smart choice for it handles better and also provides little more rear passenger space than the Passat Comfortline.